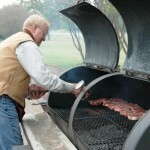 COLLEGE STATION – With Memorial Day weekend approaching, many Texans are preparing their grills and menus for a cookout. To help ensure a trouble-free time, Texas A&M AgriLife Extension Service experts have offered some advice on grilling and food safety. The National Fire Protection Association estimates gas and charcoal grills cause 4,200 outdoor fires and 1,500 structure fires annually in or on residential properties, resulting in yearly property losses of about $30 million. Cavanagh said before making plans for a cookout in a public area, check to see if there’s a burn ban in effect in that area. “It’s not only dangerous to ignore or defy a burn ban, but there can also be some pretty stiff fines for doing so,” she noted. – Set up the grill on a concrete surface or on ground where grass and vegetation in the area are trimmed and where there are no dry leaves, brush, mulch piles or other combustibles nearby. – Place the grill in an open area away from deck railings, eaves and overhanging branches or other potentially combustible surfaces. – If using a gas grill, check for leaks and make sure hose connections are tight. – Set the grill at least 10 feet away from your house or building, and do not grill in a garage or under a carport or other surface that might catch fire. – Keep young children and pets at least 3 feet from the grill. – Remove any grease or fat buildup from the grill and/or in the trays below the grill. – Keep charcoal fluid out of the reach of children and away from heat sources. – Never leave the grill unattended once the fire has been lit. – Do not attempt to move a hot grill. – Keep a multi-purpose fire extinguisher within reach. – Use flame-retardant mitts and grilling tools with long handles instead of household forks or short-handled tongs. – When finished grilling, let the coals completely cool before disposing, and use a metal container for disposal. – If using a liquid propane grill, use extreme caution and always follow manufacturer recommendations for connecting or disconnecting the tank. Along with fire safety, food safety is another important factor to consider when grilling, said Dr. Jenna Anding, AgriLife Extension program leader, food and nutrition, College Station. She said maintaining food quality and freshness by ensuring proper temperatures during its storage and when cooking are vital to food safety. Anding said poultry, fish, seafood or ground beef should be cooked or frozen within a day or two, and that steaks or pork chops should be cooked or frozen within four to five days. Regardless, she added, never thaw meats at room temperature as this may increase the number of germs related to foodborne illness. Anding said if refrigerated food is being transported to another location for cooking, it should be kept at 40 degrees or colder, using a cooler and ice or ice packs. “And you should only take as much as you plan to cook and eat that day,” she said. Anding said raw meat, poultry or seafood should be tightly wrapped or stored in a sealed bag or container and kept in a different cooler to reduce the risk of cross-contamination. Anding noted that unwashed utensils and platters can still contaminate food, even if you’ve maintained proper food storage, preparation and cooking standards. She said foods on a grill can brown quickly and look as though they are sufficiently cooked when they are not, so a food thermometer is the only way to ensure cooking to a safe internal temperature. After cooking, Anding said, be sure to keep the food hot until it is served – at least 140 degrees — otherwise refrigerate it right away. More information on outdoor cooking safety may be obtained by contacting the local county AgriLife Extension agent for family and consumer sciences or reading the U.S. Department of Agriculture fact sheet at http://www.fsis.usda.gov/Fact_Sheets/Barbecue_Food_Safety/.